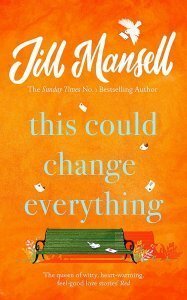 When the chance arose to be on the blog tour for Jill Mansell’s latest book, I responded with a big fat yes! I’ve been reading Jill’s books for years, devouring every single one and she is one of the authors I’ve always admired and aspired to one day be. And reading This Could Change Everything reminded me why. When a book leaves you thinking about it and the fabulous characters every second you are away and you are left with a warm fuzzy feeling and a big smile on your face at the end, you know it’s a cracker. I’m not sure where to start so I’m just going to gush away. It oozed fabulousness and I was sucked in right from the very start. I loved Essie, such a lovely character who so deserved better than Paul in my opinion. But Zillah. Oh Zillah! I think she could actually be my most favourite character in a book EVER! Such an amazing lady with a heart so huge. I wanted to be in the book, I wanted to be Essie, or Zillah. I wanted to meet Connor and Lucas and be part of their escapades. I wanted to live on the square and be part of this amazing group of people, all with their own issues and history, so interesting that I couldn’t wait to discover more about them. But each of them wanting to help others in a way that brought a tear to your eye and a smile to your face. There were parts of this book that I’ll remember forever! The book delivered so much more than I thought it would from the retailer description. I knew it was going to be good. But boy oh boy, it was totally and utterly fabulous. It was warm, it was fun, it was funny, it was beautiful. It was in fact, everything I want a book to be and more! PERFECT! 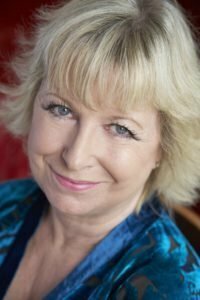 Jill Mansell is the author of over twenty Sunday Times bestsellers including THE ONE YOU REALLY WANT, TO THE MOON AND BACK, YOU AND ME, ALWAYS and MEET ME AT BEACHCOMBER BAY. TAKE A CHANCE ON ME won the RNA’s Romantic Comedy Prize, and in 2015 the RNA presented Jill with an outstanding achievement award. Jill’s personal favourite amongst her novels is THREE AMAZING THINGS ABOUT YOU, which is about cystic fibrosis and organ donation; to her great delight, many people have joined the organ donor register as a direct result of reading this novel. Jill started writing fiction while working in the NHS, after she read a magazine article that inspired her to join a local creative writing class. Her first book was published in 1991 and she is now a full-time novelist. She is one of the few who still write their books by hand, like a leftover from the dark ages. She lives in Bristol with her family. Jill keeps in touch with her readers on Twitter – @JillMansell – and Facebook – /OfficialJillMansell. You can also visit her website http://www.jillmansell.co.uk/. 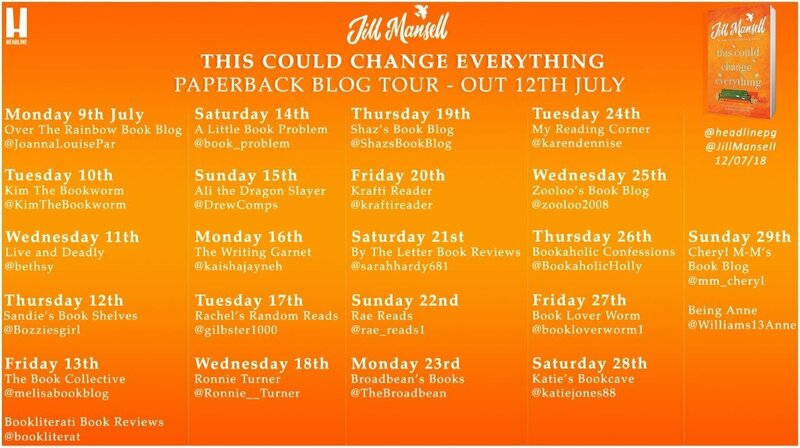 Don’t just take my word for it though, there are other brilliant book bloggers on the blog tour too!